Azor itself is a leader in project management software recognized as being incredibly user-friendly. After all, it was built in FileMaker, used by millions to create custom information solutions. 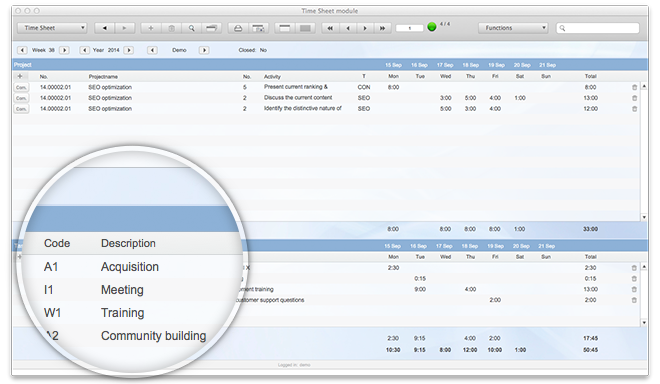 Our time management app allows managers to identify problems and discrepancies before they become problems. Eliminating the use of laborious manual entry for payroll processes saves money and time. Timesheet approval is then efficient and fact-based. The timesheet app permits the early identification and flagging of activities likely to go over budget, so billing and approaches to overruns can be reevaluated. The elimination of manual calculations increases productivity and decreases the likelihood of errors. The timesheet app enables data to be entered once, yet be included in a wide array of methods to evaluate cost, workforce, efficiency, and profitability of a given endeavor. Our seamless integration allows your meaningful project management data to be viewed from every angle, with information at your fingertips. Success requires accurate invoicing, accurate workforce hours logged, superior planning, and quotes to clients that are appropriate and support the bottom line. Timesheet software that enables you to easily create client rules to inform intelligent billing is another advantage of the timesheet software application we carry. Azor timesheet app lets you view data in an intuitive way precisely when you need it most. Determining appropriate time allocation on a given task or project is key for success in the marketplace, and being able to see the accuracy of your projections allows for more suitable billing and quotes. This precision enables you to easily recognize the most and least profitable areas of projects and better predict outcomes. 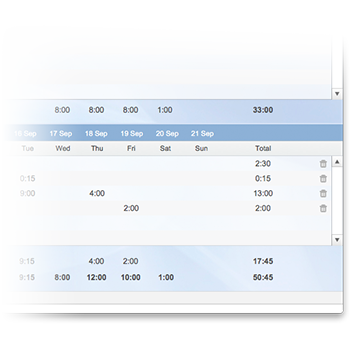 Having sophisticated yet simple to use, the timesheet app of Azor lets you view how planning and operational hours relate to one another. Real-time performance reporting enables multiple users to consistently aim in the right direction toward growth and cost effectiveness. Azor's timesheet app also allows you to easily import data files right from the start, so that you can integrate past timesheet information to intelligently drive planning and decision making. It's simple, affordable, and intuitive, which equals smart. Give our free demo a try, and see how the our timesheet software application can give you an edge.